Beriberi (vitamin deficiency) is a pathological process that develops when the flow of vitamins in the body exceeds their entering. There are vitamins that occur when absolutely insufficient intake of vitamins (see), and vitamin deficiencies - the result of a moderate excess of consumption over the entrance. When the failure of one of a vitamin develops monovitamins or monoamines. Simultaneous failure of several vitamins a polyhypovitaminosis or polivitamin. In addition, there is an exogenous vitamin insufficiency (insufficient intake of vitamins from food) and endogenous (malabsorption of vitamins in the intestine, increased their destruction, the increased demand of the body for vitamins). Early diagnosis of vitamin a deficiency difficult. Crucial in this period have laboratory tests of blood and urine on the content of vitamins, products of their metabolism or specific substances that appears when vitamin deficiency. Some cases of vitamin a deficiency is considered as specific diseases (such as beriberi, scurvy, pellagra and others). And vitamin deficiencies. A-hypovitaminosis and avitaminosis develop at deficiency in food vitamin a or carotene, and also diseases of the gastrointestinal tract with impaired absorption of lipids and liver diseases. Characterized by lesions of the epithelium of the whole body and its replacement orogovevshie, easy exfoliating cells. Patients complain of weakness, weight loss. Quite early develops blindness (night blindness - bad eyesight at dusk, at night or in poorly lit environments), later - xerosis, or xerophthalmia (dryness of the cornea of the eye) and keratomalyatsiya (melting of the cornea). The skin becomes grayish color, dry, fine papular rash that resembles in appearance goose. There is a reduction of smell, you receive a tendency to the emergence of rhinitis, bronchitis, pneumonia , followed by the development of pneumosclerosis. There is a deformation of tooth enamel, the mucous membrane of the oral cavity becomes cloudy. Decreases the secretion of salivacausing dryness of the mouth. Acid-forming function of the stomach is broken - usually develops achlorhydria. There is a tendency to diarrhea. In urinary excretory system is strong desquamation of the epithelium, groups of cells in the presence of alkaline urine become the core around which the Deposit of salt and can form kidney stones. Also, can develop cystitis, urethritis. A deficiency disease leads to the decrease of sexual attraction, and women and to the absence of menstrual periods (amenorrhea), there is a General lethargy, apathy, slow response. Treatment. Daily (medical) dose from 10 000 to 100 000 IU of vitamin a: when hypovitaminosis with the initial stages of violation of the dark adaptability-10 000 - 15 000 ME, when expressed night blindness, but without skin symptoms - 25 000-30 000 ME, if xeroftalmia to 50 000-100 000 ME a day, at skin symptoms - 100 000 ME in the day. Appointed fish oil, vitamin a pills in concentrate of vitamin A. Prevention. Content in food of sufficient quantity of animal fats and vegetables (carrots, green onions and other). In conditions of monotonous food - intake of fish oil on 1 table. 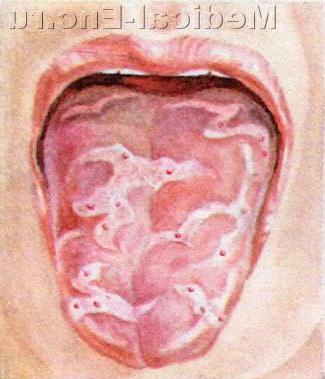 L. 3 times a day, or other drugs vitamin A.
B2-vitamin deficiency (ariboflavinoz) early apparent angular stomatitis: ulceration in the corners of the mouth, in the attachment of the skin, the mucous membrane of the lips (Fig. 1), chelsom - desquamation of the epithelium in the place of closing the lips cracking, bloody scabs and scars (Fig. 2). Language giperemia, papillae his smoothed. Patients experience pain and burning language. Seborrheic skin lesions (see Seborrhea). Lacrimation, conjunctivitis. Violation of blood (hypochromic anemia). Nervous system disorders: headache, paresthesia, lethargy. Ariboflavinoz often accompanies chronic infectious diseases, prolonged respiratory failure. Treatment. The reception inside for 15-30 mg Riboflavin within 15-20 days. In severe cases of 40-50 mg 3-4 times a day. In the absence of Riboflavin appoint yeast (bakery, beer, dry). Prevention. The introduction of food products containing a sufficient number of Riboflavin (dairy, meat, eggs, liver). PP - deficiency - see Pellagra. B12-deficiency can be exogenous with insufficient intake of vitamin B12 from food and endogenous, arising from violation of its absorption in some diseases of the stomach and small intestine (after extensive resections of the stomach, when filechecker gastritis). The most striking clinical manifestation gestagennogo B12-deficiency is anemia Addison - Biermer (see Anemia). The availability of a wide lentetsa in the gut, a sharp malabsorption of vitamin B12 in the gut when sprue (see), extensive resection of the small intestine also lead to B12-deficiency diseases. Treatment. Therapeutic dose of vitamin B12 - from 15 to 150 mcg once daily, intramuscularly. Prevention. Introduction to food meat, liver of animals and fish, dairy products, eggs. With - deficiency - see Scurvy. Biotin - hypovitaminosis (N-deficiency) may be called the person with the introduction of large quantities of egg white, which includes toxic acting protein - avidin, and also be caused by taking large doses of sulfonamides. When consuming a large quantity of egg white on the 3-4th week, there is an easy scaly dermatitis, which soon becomes a vast; the skin of the whole body is dry, you are peeling. May be the so-called geographic tongue (Fig). After 5 weeks there are violations of the nervous system depression, giperestesia), muscle pain, nausea, anorexia (lack of appetite), anemia. Treatment of parenteral introduction 150-300 mg of Biotin per day. Prevention. A complete rejection of consumption of raw egg white. The use in food of products containing Biotin (egg yolk, liver, kidneys). E-beriberi (called vitamin E is known for a number of substances - tocopherol) in adults has not been described. Can occur in infants and preschool age. The value of vitamin E in the body is well studied in the experiment. Its failure is one of the etiological factors in the development of a number of diseases of the muscular system (muscular dystrophy, primary male). Pseudohypertrophic dystrophy end of the system can occur in children whose mothers during pregnancy and lactation has received insufficient amounts of vitamin E. the Major symptoms of this slowly progressive disease - progressive muscle weakness, contractures and bone atrophy. Treatment. Designate 0.3 - 2% an oil solution of alpha-tocopherol and 1 teaspoon 1-3 times a day; spirit-diabetes drug vitamin E, 1-2 table. L. day, alpha-tocopherol acetate in pills to 25-200 mg l ampoules 50-200 mg Therapeutic dose of 100-200 mg per day. Prevention. Introduction to food raw cotton, soybean and corn oil, corn, rice, wheat. To vitamin deficiencies can only be endogenous origin, because vitamin K is synthesized by intestinal microflora with obligatory presence of bile. Occurs with prolonged treatment with antibiotics and sulfa drugs, overdose of anticoagulants, mechanical jaundice, enteritis, spru. Clinically manifested hemorrhagic diathesis, violations education protrombina. Treatment. Appoint menadione for 10-15-20 mg Daily dose of 30 mg for 4-5 days. If necessary, refresher make a break for 5-6 days. When impaired intestinal absorption of the drug is administered intravenously or intramuscularly (0.3% solution of 5 ml or 1% solution 1-2 ml). Treatment vikasola is under the control of prothrombin in the blood. P - vitamin deficiency is characterized by the violation of the permeability of capillaries. Pain in the legs, shoulders, weakness, fatigue, skin small rash. For the determination of degree P - vitamin determine the state of the permeability of capillaries (see Nesterov test). Treatment. Prescribe vitamin R in the 100-150 mg / day for 15 to 30 days in combination with ascorbic acid (100-500 mg). Prevention. Introduction to food products, which are sources of vitamin e: citrus fruit, black currant, rose hip, young shoots leaf tea, a grape vine. Deficiency of folic acid is endogenous origin as a result of violations of the processes of absorption in the intestine (total or Subtotal gastrectomy), overdose tireostaticeski drugs, resulting x-ray exposure, the presence of parasites in the intestines and as a consequence of the suppression of bacterial flora of the intestine antibiotics and sulfa drugs. When the deficiency of folic acid affects the system of blood (anemia occurs), tongue, mucous membrane of the oral cavity and gastrointestinal tract. Treatment and prevention of introduction from food products (yeast, liver, mushrooms, cauliflower), which is a good source of folic acid. To prevent folic acid deficiency it is important to provide food rations sufficient amount of proteins, especially for women during pregnancy and lactation. In the appointment of antibiotics and sulfa drugs, it is advisable to appoint folic acid. Therapeutic dose of folic acid (single equal daily) 25-50 mg inside or intramuscularly. When treating with folic acid at the same time appoint vitamin B12. The failure of choline causes fatty infiltration of the liver. This type of vitamin a deficiency has been studied only in the conditions of the experiment. The use of choline shown in liver diseases (hepatitis, cirrhosis). Therapeutic dose: 3-5 g / day orally, 2-3 g intravenously. Prevention. The introduction of food egg yolk, liver, meat, vegetables.